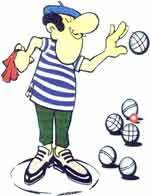 Players try to throw steel balls, called “boules” as close as possible to a smaller ball, known as the “cochonnet” or “jack”. Most games are played on whateverground is available,( but there are international rules about size). Any strip of unpaved flat ground about 11-12 m. long will make a Pitch. In Britain, a fine gravel pub yard is the most usual pitch. Modern boules are stainless steel, 7-8 cm. in diameter. The jack is often painted white. A tool called a “baquette” is used measure small distances between boules and the cochonnet. The game can be played by singles, doubles (teams of two) or trebles (teams of three). The players use four, three or two boules each, respectively. The most popular social game is doubles. League games are played in threes, but whatever the number the game is played in the same way. A coin is tossed to decide who goes first. The first player uses the baguette to scratch a circle around him- or herself 30-46 cm diam. at one end of the pitch. For the rest of the games players must stand with both feet inside the circle when it is their turn to play. The first player throws the cochonnet, which must land approx. 7-10 metres away. If the cochonet lands outside this area, the cochonnet must be thrown again.. The person who threw the cochonnet throws the first boule, aiming to get as close as possible to the cochonnet. The opposing players then have to pitch their boules until one of them lands closer to the cochonnetthan the first player’s. All players may pitch all their balls. Only when the opposing team has a boule nearer to the cochonnet than the first boule may the starting team play again. Players play with their own boules. 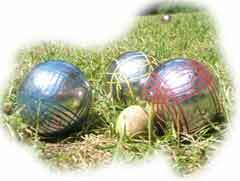 When a team has used up the boules, the other team may continue to play until it too has no boules. Each boule that is closer to the cochonnet than its nearest rival gains 1 point. The baquette is used to measure small differences accurately. Each round is known as an “End”. The winner of the first end starts the next round from the opposite end of the pitch at the position of the cochonnet. If the same game runs to three ends, the third end is played from where the cochonnet was in the second end. The maximum score a doubles team can make in an end is 6 points. The game is played until oneteam reaches 13 points. The team winning the last game plays first in the next game.